Conservative Ana Navarro is at it again, calling bullsh*t on Trump’s latest nonsense. 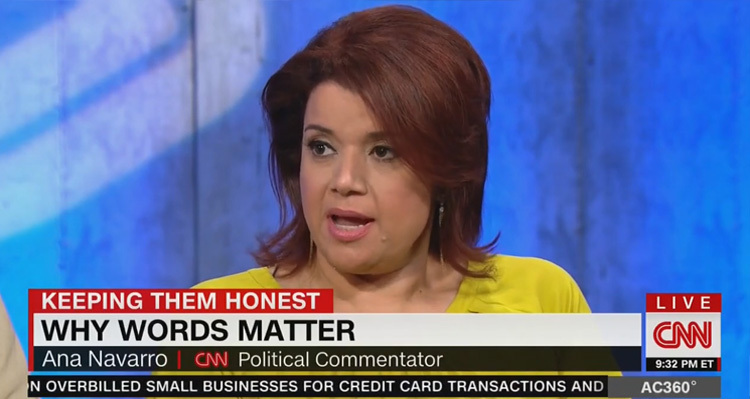 CNN commentator Ana Navarro is doesn’t mince words when it comes to her disdain for Trump. As CNN reports, Trump told reporters on Friday that he would not rule out military intervention in Venezuela. “We have many options for Venezuela. And by the way, I am not going to rule out a military option,” Trump said following a meeting with US Ambassador to the United Nations Nikki Haley and Secretary of State Rex Tillerson. She then responded to Trump’s statement about Venezuela with two tweets. Friday evening, Navarro was “calling bullsh*t,” as Raw Story put it, on Trump’s joke about Russia expelling U.S. diplomats during a panel discussion on CNN. “I want to thank him [Putin] because we’re trying to cut down our payroll, and as far as I’m concerned, I’m very thankful that he let go of a large number of people because now we have a smaller payroll,” a grinning Trump told reporters on Thursday. There’s going to come a time in this country where and it’s not “if” but “when,” there’s going to be a natural disaster or a man-made disaster where we are going to need to hear from our president and we need to believe what he is saying. If he wants to be funny, he can go to the White House correspondents dinner and try to be funny. If he wants to be funny, go to late-night. But being funny about U.S. diplomats getting expelled from Russia does not pass the smell test, should not be allowed, should not be justified and should not be explained away as a lame attempt at humor by the president of the United States. You can watch Ana Navarro and the other panelists discussing “why words matter” with host Anderson Cooper. Navarro’s remarks about Trump begin at about the 2-minute, 30-second mark.